Due to Backlog, and temporal distance, these recaps will be brief. Recap: I played a 3 land hand, but died before turn 7 to a massive Jazal attack. About the Deck: All creatures, mostly Knights, mostly resurrectable by Alesha. Recap notes: I had a Goblin Kaboomist and Koth of the Hammer, before dying to 45 Myr Incubator Tokens. This one is all creatures, all red, and moslty goblins. Again, I didn’t hit my Zombie achievement, so only 2 swaps. All I noted is that someone killed my Kruphix for no great reason, and then the next turn the other player won via Labratory Maniac. There’s a page that talks about it here, and one here too. I had Waste Not , but made 0 discards happen. I did not hit the zombie achievement, so only get two swaps. 8.5 Tails had a World Queller and a turn 1 Serra Ascendant, but my notes say that I won this one. I had Waste Not on turn 2 and a Wheel in hand, but it got killed by an Aura Shards (hate that card). Then I Decimated the Shards. I did not hit the 20 zombies achievement, so I only earned two swaps. Also, the Kynaios player complained that I took long turns, and that my deck didn’t “do anything” because Cascade was just diddly. I took offense to that; I always take my turns with purpose when playing this deck, and I don’t actually always just cascade. Some Highlights (as I am writing this almost 7 months after playing the game). This is the first game to be recorded in the “Book of Simic” (my second moleskine in this project). I got to Deathrender in a few dragons, and Tasigur. Mid game, I traded my non-Japanese Scourge of Valkas for Radha’s Japanese one. I did cast Scion at least once, and it became a Scourge of Nel Toth (but I died that turn). I was at 1 life. 3 mono-colored dragons of each of the five colors. 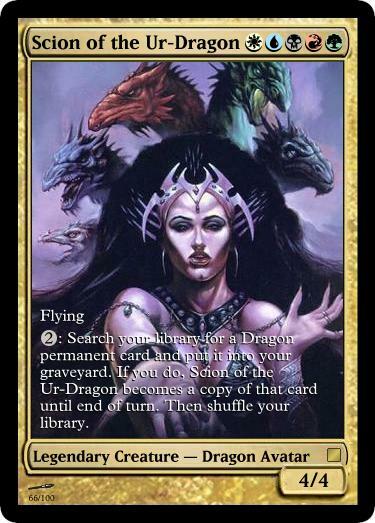 5 Viashino (1 one of each color) as “Draconians”. Died before turn 10 to a huge army that included a 150/150 selfless squire that Kynaios gave trample somehow. Also Omnath vomited out like 30 elementals all at once with Scapeshift. I didn’t make as many tokens as I planned to. This was the very last game to fit into “The Book of Orzhov,” the purple moleskine that I keep my game write-ups in. Time to get a new book! Ravos is my favorite partner, and Tana makes 2/2s when he’s around. This deck is mostly about making tokens and swarming.